SAN FRANCISCO (Reuters) – eBay Inc (NSQ:EBAY) founder Pierre Omidyar on Wednesday said he is building an independent media organization covering news from sports to politics for mainstream readers, spearheaded by big names including ex-Guardian correspondent Glenn Greenwald. 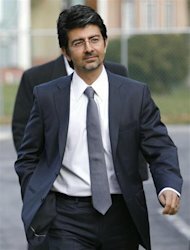 Omidyar, the 46-year-old French-born Iranian-American who remains chairman of the e-commerce giant he founded, wrote in a blog post that he considered buying the Washington Post – which Amazon.com Inc (NSQ:AMZN) founder Jeff Bezos eventually snapped up – but decided he wanted to build a news organization from the ground up. “Right now, I’m in the very early stages of creating a new mass media organization. I don’t yet know how or when it will be rolled out, or what it will look like,” he wrote. Omidyar’s active Twitter feed suggests he is very concerned about government-spying programs exposed by Greenwald and former U.S. government contractor Edward Snowden. In his blog post, Omidyar spoke of his growing interest in the role that journalism plays in society, and his own support of efforts to promote government accountability and transparency. Forbes pegged Omidyar’s net worth at $8.5 billion. Among his ventures is Honolulu Civil Beat, a news website covering public affairs in Hawaii. Civil Beat aims to create a new online journalism model with paid subscriptions and respectful comment threads, though it is unclear how successful it has been. Omidyar also founded the Democracy Fund to support “social entrepreneurs working to ensure that our political system is responsive to the public,” according to its website. Omidyar added that Greenwald’s former colleagues, Laura Poitras and Jeremy Scahill, would also join his media project. “I’ll be sure to update you along the way as the new organization progresses,” he said. I’m thrilled to announce that the Omidyar Network has made a $1.2 million investment in Global Voices’s work. Omidyar is a philanthropic foundation created by eBay founder Pierre Omidyar and his wife Pam to improve people’s lives through “harnessing the power of markets”. Omidyar has supported some of the organizations we most admire – the Wikimedia Foundation, Creative Commons, Ushahidi, WITNESS – and we’re particularly honored to be part of a “class” that includes UK-based transparency organization MySociety and Kenyan political satire troupe, The XYZ Show. Omidyar is known for challenging their grantees to move towards financial stability, a path that we’d already made a high organizational priority. With support from Omidyar, we’re planning to expand our readership online and via email, to enter into syndication agreements (like the ones we have with La Stampa and Reuters) with at least five new partners and to start creating original content in French and Spanish as well as in English. Funding from Omidyar is also helping us shore up the infrastructures necessary to manage our complex and international team. GV editors and contributors are on every continent but Antarctica and our management team is scattered across the globe. While we’re committed to being a virtual organization without offices or filing cabinets, we’ve got a lot of practical and administrative challenges to face to ensure we’re able to continue amplifying and sharing citizen voices from around the world. Anyone who has worked in the nonprofit community understands that support for these unsexy sorts of activities is the hardest sort of money to raise – we’re particularly grateful that Omidyar is making an investment in our whole organization and not just a specific project. We’re really excited about this new development and to working closely with our friends at Omidyar, especially Stephen King, Omidyar’s Senior Director of Investments. Later this year, we’ll be expanding our board of directors by two members, including Stephen and a third representative elected from our staff and volunteer community. Thanks to Omidyar – and all our wonderful supporters – for making this community possible. 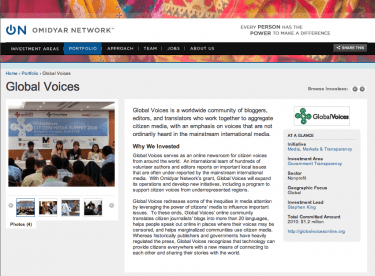 Global Voices was launched as a project of the Berkman Center for Internet and Society at Harvard Law School. Their institutional and financial support made Global Voices possible. We are grateful to the John D. and Catherine T. MacArthur Foundation for their ongoing support for our editorial staff. The Omidyar Network for their ongoing support of our administrative section, our editorial staff, and Rising Voices. The Media Development Investment Fund (MDIF), for their strategic planning and financial support. MDIF is a mission-driven investment fund for independent news outlets. The Open Society Institute supports Global Voices editorial projects, including RuNet Echo. They also support GV Advocacy, Rising Voices, the Technology for Transparency Network, our core operations, and our summit meetings. The Ford Foundation supports the Global Voices Lingua translation project, and research into its further development. The Dutch NGO Hivos is a major supporter of Global Voices Advocacy for online freedom of speech, Lingua, and our editorial staff. Special thanks to the John S. and James L. Knight Foundation for support to create Rising Voices, and for funding Global Voices’ US$10,000 Knight-Batten Innovations Award in September, 2006. Reuters was our flagship editorial supporter for several years, and is presently an editorial partner. With the power of Podio, our free project management software, our team can effectively work together from anywhere, to escape email overload, alleviate document chaos and much more. Get structured with Podio’s easily modified workspaces and apps, so you and your team can work the way you want to. 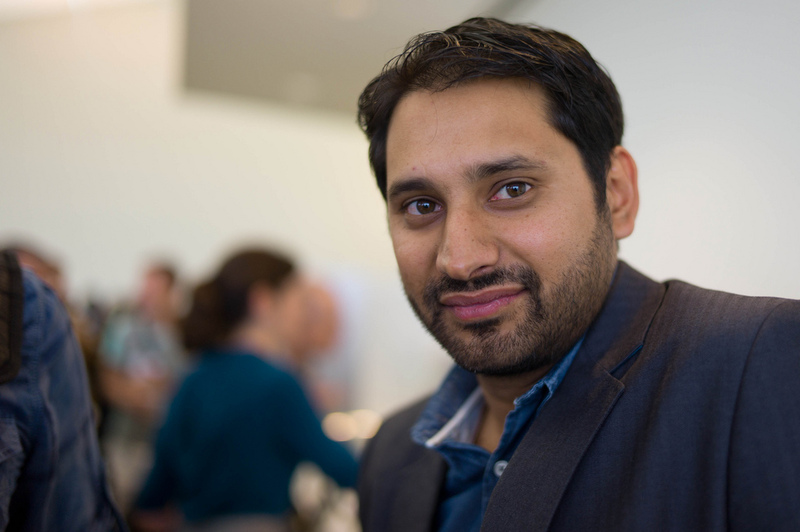 We’re very pleased to announce that internet entrepreneur Mohamed Nanabhay has joined the board of Global Voices…..As the Head of Online at Al Jazeera English, he led the team that produced the award winning coverage of the Arab revolutions in 2011. During this period he pioneered and launched the Al Jazeera’s Creative Commons Repository…He was named a Creative Commons Pioneer by BusinessWeek, serves on the Board of Directors of the Media Development Investment Fund and is a member of the World Economic Forum’s Global Agenda Council on Informed Societies. ProPublica, a New York-based Web operation that already shares content with many news organizations, will give NBC stations an early look at databases it develops on a range of complicated subjects. Its previous projects have, among other things, showed which doctors took payments from drug companies, rated the quality of care at dialysis centers and the performance of secondary schools. and US taxpayer supported NPR. NBC has reached an agreement to broadcast news content provided by a media organisation run by a team that has ploughed millions of dollars into campaigning for Barack Obama and donated large cash amounts to organisations such as the George Soros affiliated MoveOn.org and the now defunct ACORN. General Manager – Richard Tofel is the general manager of ProPublica, a non-profit investigative journalism organization in New York. Previously, he was the president and chief operating officer of the International Freedom Center. Mr. Tofel took over that position in October 2004. He is a member of the board of trustees of Wildcat Service Corp., the advisory board of the Knight-Bagehot Fellowship Program in Economics and Business Journalism at the Columbia University Graduate School of Journalism and the Joan Shorenstein Center on the Press, Politics and Public Policy at Harvard’s John F. Kennedy School of Government. Mr. Tofel …On December 12, 2010, he married JANICE NITTOLI. (she worked for the Rockefeller Foundation as director of the Campaign for American Workers, program dedicated to public policy reform and providing workers with greater access to health care and retirement savings and income. She became President of the Century Foundation one year later. Committee to Protect Journalists (CPJ)’s board of directors has included prominent US journalists including Christiane Amanpour, Tom Brokaw, Anne Garrels, Charlayne Hunter-Gault, Gwen Ifill, Jane Kramer, Anthony Lewis, Dave Marsh, Kati Marton, Michael Massing, Victor Navasky, Andres Oppenheimer, Clarence Page, Norman Pearlstine, Dan Rather, John Seigenthaler, and Mark Whitaker. NB: Propublica – won a Pulitzer Prize within a year of going online – no surprise as these Soros-type start-ups always get an award in order to give them prestige and “credibility”. Why is corporist Omidyar lying about being concerned by the actions of the NSA since he’s always supported them? And his deal with Greenwald whose supposedly holding lots of high level NSA info is highly suspicious. This entry was posted in Uncategorized and tagged eBay founder to launch independent mass-market news venture. Bookmark the permalink.